Oh what fun it is to ride in a one horse open sleigh! 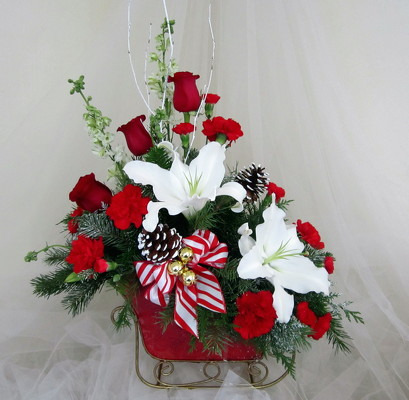 This beautiful keepsake sleigh is filled with white lilies, red roses, red carnations, and fragrant winter greens. Send a someone special Christmas wishes this holiday season. Red roses, burgundy carnations, and Christmas greens mixed in a beautiful ceramic Christmas ornament. 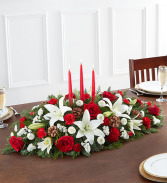 Nice red ceramic sauce bowl showing a beautiful arrangement with red roses, white football mums, white cushions, red berries, white fillers, greens, pine cone, and silver ornaments.